A group photo of many of the original Allen Building protesters who returned for a weekend commemoration outside of the Doris Duke Center at the Sarah P. Duke Gardens. Rebecca Martinez reports on a conference that commemorated the Allen Building takeover at Duke University. It's been 50 years since nine black students at Duke University took over the Allen Building on campus to protest segregationist university policies and bring attention to the needs of black students. Their allies protested outside, and sustained tear gas from police. Duke officials sanctioned the protesters and put the occupiers on probation. Administrators later relented, approving the creation of a Black Studies program, and began to recruit students and professors of color. 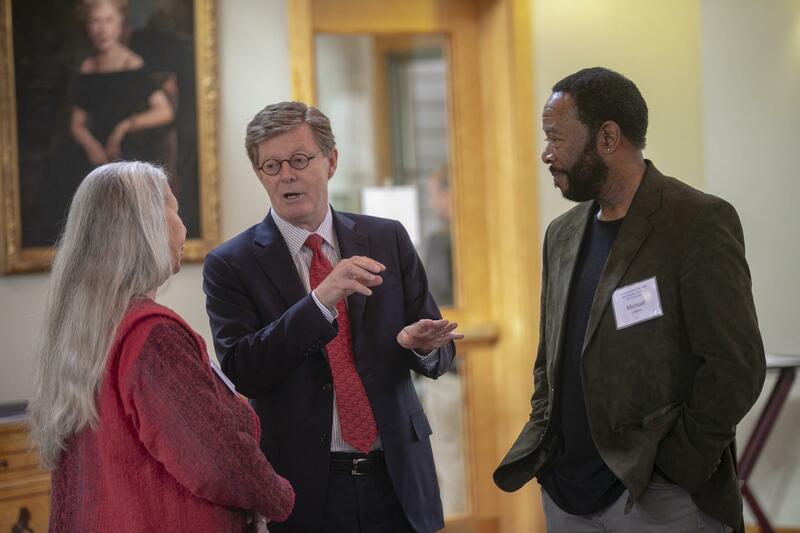 This past Saturday, the African and African American Studies department hosted a conference to commemorate the anniversary. It was a reunion of sorts for the student activists from the 1960s to reconnect and share stories. But the conference also planned a look forward, and arranged a panel called "Activism Then and Now: And Intergenerational Conversation." Current Duke undergrad Sydney Roberts was one of the panelists. They said Duke's administration has not warmed up much to student activism since the 1960s. Just three years ago, Roberts and several other student activists occupied the Allen Building to demand a living wage for staff and other protections for people of color. "I've been pulled through student conduct two times because I've been a part of a student demonstration that was asking for workers to be able to pay their rent," Roberts said. "We're asking for black students to be able to feel like, if something happens to them, like the N-word gets written on the Mary-Lou, that they have some sort of process for dealing with the constant racial violence that they're facing on this campus." Duke University President Vincent Price speaks with 1969 Allen Building Takeover protesters Lynette Allston, '72, and Michael LeBlanc, '71. Original Allen Building occupier Janice Williams was also on the panel, with her son, Torraine Williams. He's active in Duke's Black Alumni Association, and he says activism will remain necessary at Duke until everybody feels welcome. 'We're definitely not there yet," Torraine Williams said. "We're definitely not there if the music we want to play in a coffee shop can't be played and we get fired over it. We're definitely not there if we still got nooses being put up and we seeing them on campus." Community activist Howard Fuller has been supporting racial equity in education since the 1960s, when he organized support in Durham for the Allen Building occupiers, and founded the Malcolm X Liberation University. On the panel, he acknowledged that the push for change is daunting. "If you believe, and I do, that racism is woven into the fabric of American society, and it has a permanence, then the question is...Why would you fight? The reason why you have to fight, even when victory is not possible, because not to fight is to cosign on the injustice," Fuller said. Despite the frustration panelists expressed, the tone of the event was celebratory, even by administrators. At a private brunch earlier that day, many people said they heard Duke's current President Vincent Price praise the Civil Rights activists for their efforts a half century ago. That's why current student activists Sydney Roberts accused administration of hypocrisy. "How many years after '69, they're finally willing to say, like, 'That was a good one.' That's the one instance of good direct action, it's because they feel like they can control the narrative a little bit more right," Roberts said. "They didn't say that in '69," Howard Fuller interjected, and the audience laughed. Roberts continued, "What makes student activism so amazing and life-giving is that in spite of all of that, everyday we wake up and fight. Right? Everyday we wake up and push administrators to hold themselves accountable and to the code of conduct that they set forth for students." And everyday, Roberts said, they work together to make Duke a place that feels more like home. Duke Officials say they have identified the person who hung a noose outside the Bryan Student Center yesterday. Officials did not release the name of the person, citing the Federal Educational Rights and Privacy Act. They did say the person was an undergraduate student and is no longer on campus. Tips from other students led campus investigators to the individual, who admitted to the act. The Hillsborough-based coffee shop Joe Van Gogh has cut all ties with Duke University.